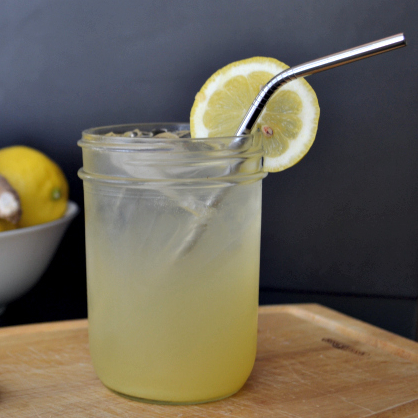 Satisfying Summer Drink: Ginger-Lemon Mocktail! That's the question I ask when the days lengthen, the south winds blow, and the temperature soars above 90 (or 100) degrees Fahrenheit. I start to fantasize about changing leaves, cool winds, and the end of Daylight Savings Time. I have to admit, I'm a fall/winter kind of girl. Today I want to share with you the beverage that makes summer bearable for me. It's the drink I whip up in a matter of seconds when my armpits are soaked with sweat by 11:00 in the morning (yes, because that actually happens). It's my version of a bubbly, non-alcoholic cocktail that detoxifies, invigorates, and allows you to pretend for a few precious moments that you're lying in a hammock on a white sand beach in Fiji… until your son shoots you in the back with his Nerf gun and snaps you right back into reality. Ginger, lemon, and apple cider vinegar — the star players in this easy-peasy beverage — rock my world. They're such small, simple ingredients, but each one of them packs a powerful punch to nourish, hydrate, and detoxify your body. Mix these 3 together with some bubbly and raw honey or liquid stevia, and voila, you've got the perfect summer drink. I even love its beautiful color! There's one small step before you make the actual drink: making a ginger concentrate or ginger tea. It's helpful if you have a juicer so that you can quickly juice the ginger for the “concentrate” and drink your mocktail right away. I'll give two alternatives below — “juicing” with a high powered blender, or making ginger tea. This drink is so bubbly and, did I mention, refreshing?! Like my stainless steel drinking straw? You can get your own here! Fill a pint-size Mason jar with ice. Add the ginger concentrate or ginger tea (see recipes below). Squeeze in the juice of the lemon. Pour in the sparkling water, but don't fill your glass completely. Leave some room to add more ginger, lemon, vinegar, and/or raw honey or stevia to your taste preferences. When it's just right, give it a good stir, and you're done! 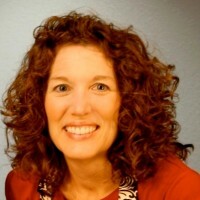 *Invest in a mineral-rich sparkling water, not club soda, tonic water, or seltzer water. Mineral water is going to give you the bonus of naturally occurring minerals from the source, not just water with carbon dioxide added. Don't know the difference? This article is really helpful in deciphering the differences between all those bubbly waters out there! 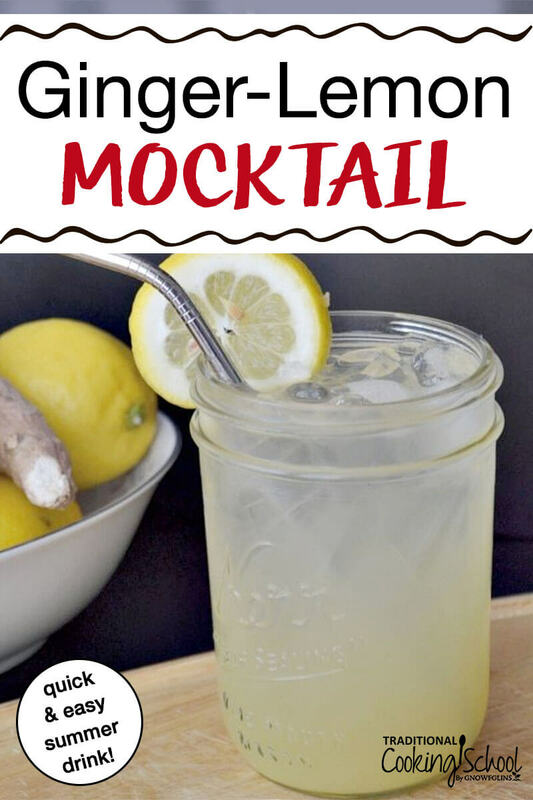 *My perfect ginger lemon mocktail requires about 1/4 cup of the ginger juice concentrate, 1 whole lemon, 1 tablespoon of ACV, and 6 to 7 drops NuNaturals Liquid Stevia. Keep this "concentrate" in the fridge for up to 1 week. Yes, I know it's diluted with water and not a concentrate, but ginger juice is STRONG, and you're going to dilute it even more when you make the mocktail. I make up a batch of this every week so I can enjoy my perfect drink any time! 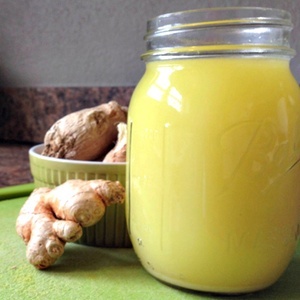 Run the ginger root through your juicer. Take that bright yellow juice and pour it into a pint-size Mason jar. Fill with water. This is the "concentrate" that you can keep in the fridge for up to 1 week. Pull it out any time you feel like refreshing yourself with this mocktail. *Note from Wardee: You can "juice" ginger using a Vitamix or BlendTec by blending the (peeled) ginger root and some water until it's as smooth as possible. Then strain out the ginger fibers by pouring the mixture through fine cheesecloth or a fine strainer, catching the juice in a bowl or jar. Now combine the juice with more water to fill a pint-size jar. Click here to see this on Instagram. 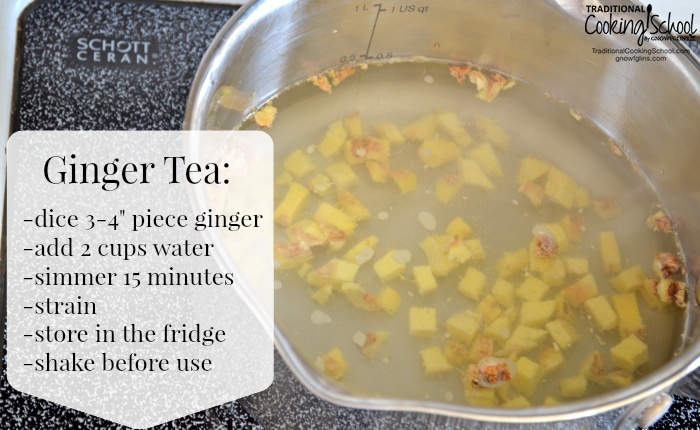 If you don't have a juicer or high-powered blender, you can make ginger tea for your mocktail -- which is essentially the same as making ginger root tea. Peel and dice or grate the ginger root. If dicing, the pieces should be about 1/8 inch cubes. 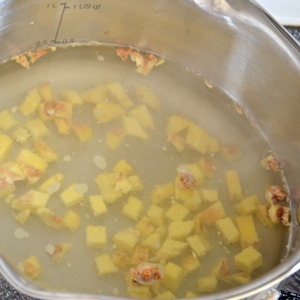 Add the ginger and water to a saucepan and bring to a boil. Once boiling, reduce the heat, cover, and simmer for 15 minutes. 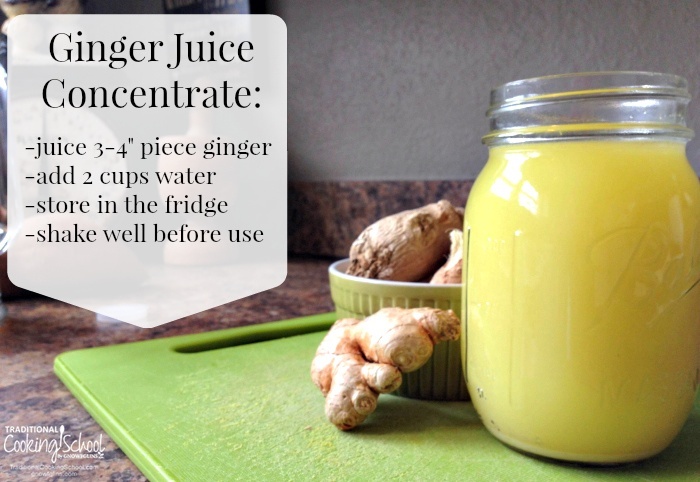 Strain the ginger out, cool, and store the ginger tea in a pint-size Mason jar in your fridge for up to a week. *Be aware that this ginger tea will not be as strong the ginger concentrate recipe above. I prefer the juicer method because I absolutely delight in that stronger ginger flavor. We've got 3 more months of sun, beach trips, baseball games, gardening, and sweating ahead of us. Here are a few more “mixed drinks” that you can enjoy year round, but especially this summer! 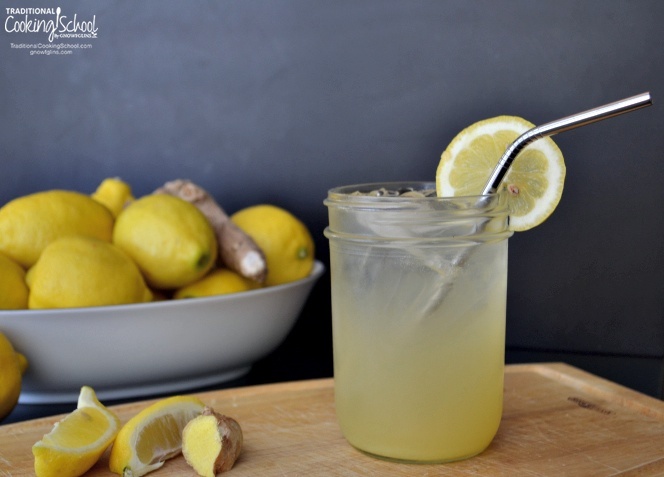 Will you try my ginger lemon mocktail? What is your favorite refreshing summer beverage? Yes, Yes, Yes I will be trying your mocktail!!!! I’m in the middle of making cottage cheese right now but have got my juicer out already! I’m going to make this as soon as I finish the cottage cheese. Thank-you so much for this post!! I drink this kind of thing all the time – have one next to me now. 🙂 For the ginger, I just squeeze a little hunk in my garlic press and let the juice run into my cup. Works great, as long as you have a good, sturdy garlic press. Great tip, Beth — thank you! I juice the ginger and lemon, put them in ice cube trays and add them to my ice water. Great all day with out any sweetener. Will have to try adding apple cider vinager. Note of caution to honey users- adding the honey to the chilled mixture ends up with hard globs of honey stuck to the spoon. Try dissolving the honey at the beginning when you add the ginger juice. I love this, but made a couple of changes. First, I don’t have a juicer or a super-high-powered blender, but my regular countertop blender is pretty good – so I threw the ginger in with a little water and pulverized away. Then I put it in a pint-sized jar with additional water overnight. The next morning most of the fiber had settled to the bottom. Initially I just used the liquid on the top, but then I tried shaking the jar and using the fiber too. It was great, and the added fiber can only be good for me. I also left out all sweetener. Having transformed my diet to a low-carb one a few years ago, I find that I my tastes have changed and I rarely need sweetening added to anything. Definitely the case here – I love it without the sweetener. I also use plain water – I’m just not a bubbly type of person. 🙂 Unless we’re talking the mild carbonation in kombucha – love that! Thanks for the recipe. I’ve been trying to get ACV into my regular routine. Sounds great. I love ginger and lemon. I will be making some soon! Blend 1c kefir water with the remaining ingredients. Pour into a 1.5+ qt pitcher with remainng kefir water and stir. Stir well just before stirring. If you don’t like raspberry seeds, blend berries w/ kefir h2o, strain, then blend with the rest of the ingredients. I also sometimes add chia seed gel. If you use frozen ginger, just grate it. No need to peel. If using fresh, wash and peel it first. I recommend grating or mincing to make sure you don’t end up with chunks in your drink. There’s so little ginger in this drink that the fiber isn’t noticeable. To freeze fresh ginger root: wash, dry and wrap in plastic wrap. I’ve been making my own ginger syrup concentrate for homemade “ginger ale” for a couple of years. I add the raw honey while the syrup is warm (but not so warm that it offsets the benefits of raw honey) and then it dissolves better. I’m curious though, as a ginger is a warming food, how does it cool your body on a hot day? My friend made this summer drink for me yesterday and I really love it! It tastes so good! Nothing is better than lemonade in the summer! sounds excellent however mineral water contains inorganic minerals that are accepted into but not assimilated by the body.